The London Children’s Ballet commissions a new narrative ballet each year and we have a special matinee for children’s charities and the elderly. We discovered that getting to the theatre and the lack of wheelchair spaces meant that it was an ordeal to attend so we decided to take the ballet to them instead. The £350,000 funding gap arose when a backer pulled out due to problems with the international money markets. But Nick Wild of Film Squared thinks it is a good opportunity for Yorkshire businesses to invest in the production. "We have already had great support from some passionate local private investors and financial professionals. Now we are looking to extend that opportunity," he said. "With global cinema and DVD distribution the project offers great possibilities for local brands. "We are working with many local agencies and have a raft of opportunities - from high-level corporate sponsorship to tax-efficient investment regimes for private investors. Now some blogs. 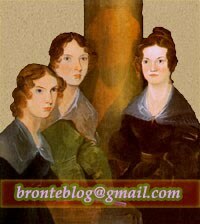 frogma has read Jane Eyre and Jasper Fforde's The Eyre Affair: Eyre & Eyre, the perfect pair. The Brontë Parsonage Blog informs about next Sunday's broadcast in the UK of Wuthering Heights 1998 (check our TV alerts sidebar section). And lastly The Pedalogue writes about Haworth.